This trip has really changed the way I see things in the world. Not just people traveling the world to bring the Good News of Jesus, but the way faith is practiced and everything that happens all around the world. One thing that has really been on my mind the past few days is how things happen in these places we call poor or unreached that don’t happen at home. What I mean by that is, here you hear about witchcraft, healers, and even demon possessions. You just don’t see that or hear about that stuff in the States. I’ve had many people in my small group say, “Why don’t we hear God like they did in biblical times? Why don’t we see him at work doing miracles?” I feel like being given the opportunity to witness what happens outside of our norm has given me the answer to that question. The reason people don’t think they hear God is because they aren’t truly focused on him. Realistically everyone is all focused on what’s new in stores, what this person is saying about that person, how can you get people to like you, etc. When really God is being put on the back burner. Everyday people pray to God as a last resort. “God give me a good grade on this test!” If you wanted a good grade so bad put in the work and study! Many people pray selfishly. 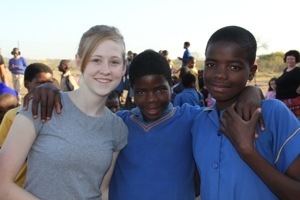 From what I’ve seen in Swaziland while I’ve being here is that the people here pray because it’s all they have. They pray so their families won’t starve. They pray that Jesus would come and get rid of the demons in their people. In the States you think you don’t see demons when really they are everywhere. People say they believe in Jesus but will turn around and do something that doesn’t follow Christ. Doing those things are what have allowed the demons to creep in and spread. When it’s nation wide people don’t really see it. Until people start fully committing to Christ demons will continue to come. So to be short and sweet in answering the question, if you want to see God, don’t get caught up in all your problems and what others are doing. Open up your heart and give it all to The Lord. Live your life for Jesus Christ and you will begin to be blessed and see God working in your life and through you to work in other people’s lives. Such wisdom! Great insight and an ability to express it. The India team saw / experienced the same thing this spring. Such pure thoughts. She speaks the truth. You have seen what breaks God’s heart, seperation from his children. What a perspective! You have caught the meaning of what it is to be a follower not just a fan of JESUS.